We’ve known for a while that Apple is working intently on self-driving car technology, but we now have our closest ever look at what the company has dubbed Project Titan. This is thanks to MacCallister Higgins, the co-founder of another autonomous vehicle venture called Voyage, who tweeted a short video of Apple’s hardware atop a Lexus SUV. Tim Cook has stated previously that Apple is concentrating more on the AI side of autonomous driving technology rather than making any attempt to release an iPhone-inspired fully-branded Apple car. That goes some way towards explaining why Project Titan appears to be so top-heavy. 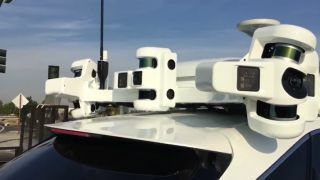 According to Higgins, the large rooftop hardware probably contains “the majority of the compute stack,” which makes it different from most self-driving cars that would usually house this hardware within their trunks. Though keeping all of the sensors, radars and autonomous hardware together makes for an extremely bulky bit of hardware, it has the benefit of potentially being far more transferable. Keeping all of the technology together in one removable roof rack means that very little in-vehicle modification is required to use Project Titan at the moment. In the testing period this modularity is useful for Apple as it can swap the technology between test vehicles quickly and easily, but if this design carries through to the final product, it could be highly beneficial to consumers as well. It’d mean that Apple’s self-driving technology could be adapted for a variety of vehicles and Project Titan could potentially be offered as an add-on for car brands that haven’t had the resources to develop their own built-in autonomous systems. Just make sure you avoid any low-down bridges or car park entrances.